Law enforcement officers from UNCW joined colleagues from across the state to share how an immersion program is changing the way they interact with Latino communities. Seventeen officers who participated in the Go Global NC Latino Initiative gathered at UNCW April 27 to discuss steps they have taken to improve relations with Latino populations they serve. Go Global aids state government and community leaders in developing relationships and strategies to positively integrate Latinos into their new communities. 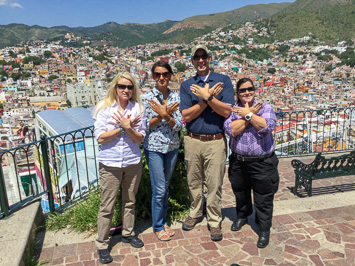 In September 2017, three UNCW officers and Centro Hispano director Edelmira Segovia joined Go Global’s immersion trip to Mexico. While there, the group spent time with law enforcement units and host families. Following the trip, officers developed action plans and identified resources to support their outreach to the Latino public. The decision for UNCW Police Department to “Go Global” was an easy one, said Chief David Donaldson. Donaldson noted promoting a diverse and inclusive culture and a global mindset throughout campus is among the university’s strategic goals. UPD and Centro Hispano hosted a “Know Your Rights” workshop on campus and a workshop focused on the lessons they learned during the immersion program. The department also held a cookout, inviting Latino and Hispanic students to get to know the officers and offered ride-along experiences for students interested in learning more about the department. From left to right: Officer Erin Bray, Centro Hispano director Edelmira Segovia, Officer Milton McLamb II and Officer Kara Mariotti in Mexico City.